People have to eat and water has to be safe to drink, no matter what. A lot of preppers are planning to use propane, butane, and kerosene fuels for cooking and heating water in case of emergencies, natural disasters or the end of the world, and that’s smart. Longer term planning, though, raises the question, “What do I do when the fuel runs out?” It’s very easy to imagine shortages of all fuels, including gasoline and diesel, even as a temporary condition. As another alternative, I suggest giving some thought to how you’ll prepare food and heat water without any liquid or gas fuel whatsoever. One option is a solar oven. 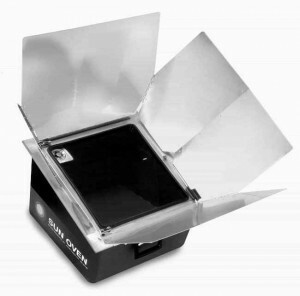 A solar oven can be as simple as a box lined with aluminum foil or, my preference, the Global Sun Oven. If you’re like me, anything that is overly complicated or inconvenient is rarely used, and that is why I love the Sun Oven. It’s portable enough to be taken on camping trips, light enough for my kids to carry, and the set-up takes just a few seconds. As long as there is sunshine, this baby can cook anything from hard boiled eggs to roasted chicken to casseroles and cookies. I learned that I can make homemade chicken soup with a simple combination of noodles, veggies, water, and raw chicken. Yep, raw chicken. As the soup heats up and cooks, the chicken and water create a rich broth, so I don’t have to use canned broth or bouillon cubes for flavor. You can even pasteurize water in a solar oven. Water actually pasteurizes at temperatures below boiling, and I recently discovered a terrific low-tech method to determine when water is safe to drink. The Water Pasteurization Indicator (WAPI) is a simple, small polycarbonate tube that contains a small amount of wax. This wax melts at the same temperature required for pasteurization of water and milk. Dangle the WAPI into a container of water, and when the wax is melted, you know the water is safe to drink! When the WAPI is removed from the water, the wax hardens, and it’s ready to use again and again. Brilliant! With solar ovens, you never have to worry about fuel, and this is a big advantage. The cooking process may take a bit more time, depending on the type of oven you use and how much sunlight is available at the time. You can help the oven cook faster by refocusing it toward the sun every half hour or so. This is just a simple process of angling the oven in the direction of the sun, taking no more than a minute or so. On overcast days, a solar oven isn’t going to work, but there are other options for grid-free and fuel-free cooking. Take a look at stoves that require very small amounts of charcoal or wood. Although wood is technically a fuel, it isn’t something you normally have to purchase or rely upon an outside source to provide. The 4 Block Rocket Stove is an example of this type of stove. It’s small and can be build very fast, and as long as you know how to start a small fire using tinder and small sticks, you’re good to go. Along with a stove of this type, you’ll need a few pieces of cookware that can be used over an open flame, and then plenty of practice! Cooking off the grid is a challenge but one that is worthwhile, whether you use your knowledge on camping trips, during a power outage or all-out TEOTWAWKI.